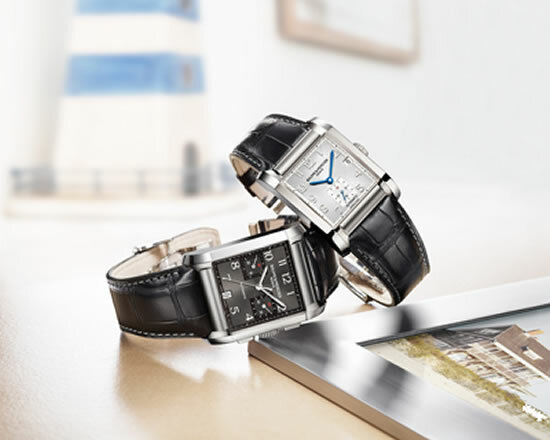 Drawing inspirations from the American landscape in New Hamptons, and museum pieces of the 1940s, Baume & Mercier is out with the Hampton collection. 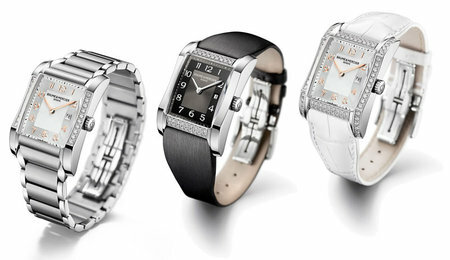 Launched at SIHH, 2011, the collection features both men’s and ladies watches. 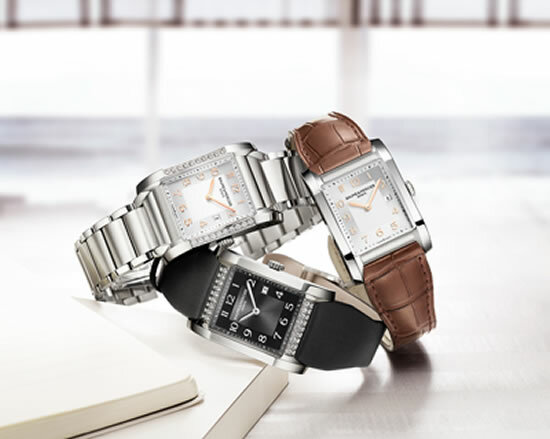 As it is inspired by the art-deco of “a museum piece from the 1940s”, the watches sport a “satined domed volume at 12 and 6 o’clock”, and a “curved sapphire crystal, and a curved case side at 3 and 9 o’clock”. 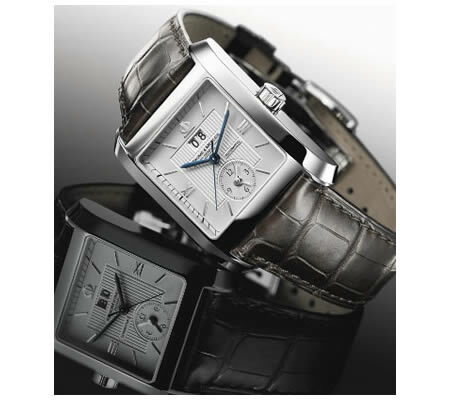 the watches also feature refined sword hands to add to the elegance of the watches. The ladies watches sport a 27 x 40 mm dial with the same “satined domed volume and curved case side of the museum watch”. The watches in the Core Collection models have been finished with an alligator or satin-finished polished steel strap with polished links. You can also opt for a jodhpur” shaped strap, which is lighter and more comfortable for al day use. 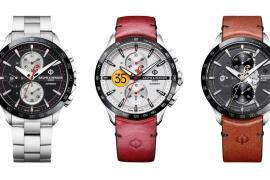 As for the watches, you can pick from two high-end models. The first sports 20 diamonds weighing 0.73 carats, which are encased in “the curved case side of a version with a silvered dial featuring a sunburst satin finish on the outer part and opaline finishes in the center, or an equally chic two-toned dial in black and anthracite”. The other setting sports two rows of diamonds placed on the satined domed at 12 and 6 o’clock; totaling to 36 diamonds (0.48 carats) . 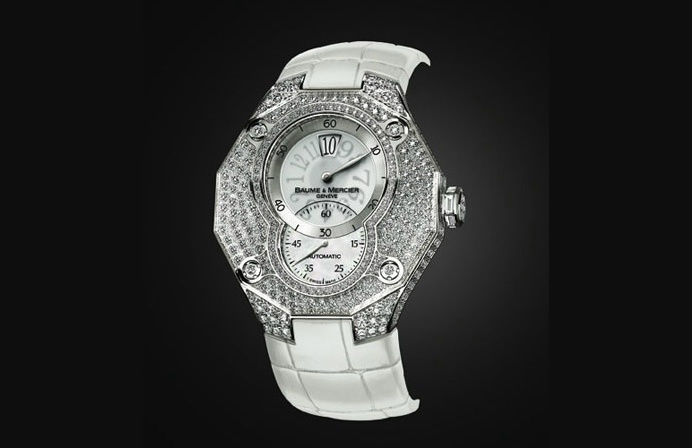 The collectors special watch however sports a fully-set case with lugs, satined domed volume and curved case side finished with a white alligator strap and sports a total of 80 diamonds worth 1.78 carats. 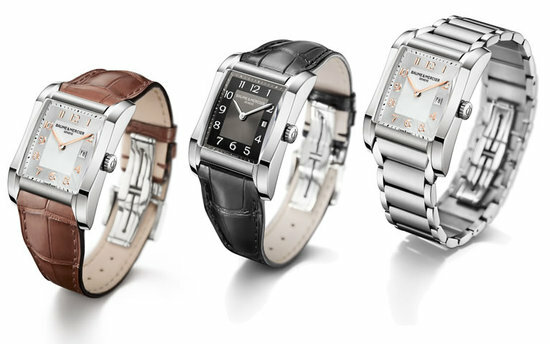 The “Sundeck décor” caseback designed by Baume & Mercier lets you add a personalized message too. The men’s collection come in a self-winding edition with a and an 32 x 45 mm dial or an automatic chronograph edition featuring red counters on a 30 x 47 mm dial, both running using the ETA 2894 movement. Avaliable in dual-toned masculine hues of black and brown, or black and anthracite, the satined domed look is finished with a straight alligator strap with an adjustable triple folding clasp. The collection features two collectibles based on the Art Deco lines. 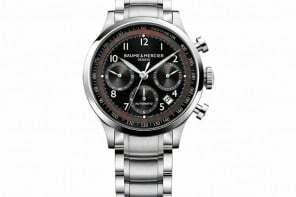 The first is available as asteel automatic chronograph version with a 34 x 47 mm dial and offers 65-hours of power reserve and an open case back. 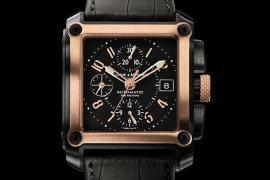 The red gold edition comes with a 42-hour power reserve and an oval open case back.